Scott Prebys is a multi-instrumental percussionist with numerous performances in the jazz, classical, pop and ethnic-music genres. He recently completed a highly-successful career in higher education (37 years) during which he made two performances at the Montreux Jazz Festival (Switzerland), recorded for the Sea Breeze label, served as a clinician in 20 states and five Canadian provinces, and directed all-state jazz ensembles in Montana, Idaho, South Dakota, and British Columbia as well as the Kansas City Youth Jazz Orchestra in 2018. He is a 2009 recipient of the North Dakota Governor’s Award for the Arts in Education and was a faculty member for the Kansas City Jazz Alliance workshops (12 years), the International Music Camp (21 years) and the College of Southern Idaho jazz workshop (five years). His performance groups have consistently received high ratings in festival competitions. Scott can be heard on weekday mornings throughout North Dakota on Prairie Public radio as host of Prebys on Classics and on Saturday evening as host of Prebys on Jazz, now syndicated in several states. 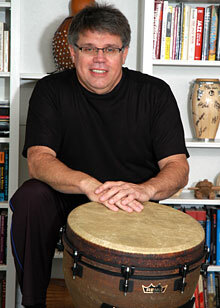 He serves as a clinician for the Ludwig Drum Company and has performed with numerous artists in jazz and pop genres. He holds performance degrees from the University of Colorado, Indiana State University, and has attended the Eastman School of Music for post-graduate study.